‘Tis the season for Holiday Gift Guides! When it comes to Christmas festivities, I’m generally an after-Thanksgiving person myself, but I do like to get the bulk of my shopping done before the busyness of the season sets in. I’m sure many of you feel the same way, and with Black Friday just days away (and most stores already rolling out their Black Friday deals), the time for Christmas shopping is now. 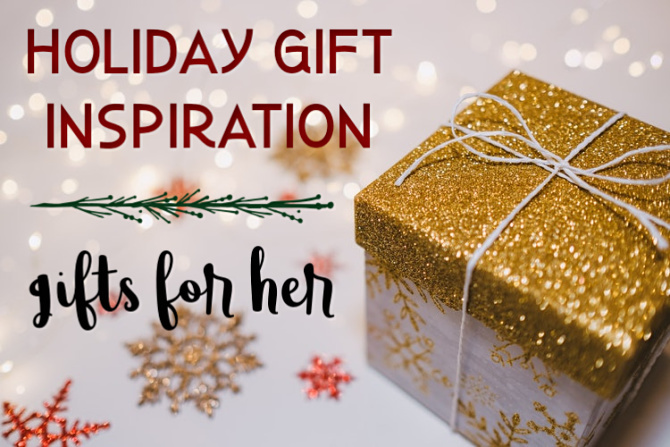 If you are finding yourself in need of a little gift inspiration, I’m here to help! This week I’m bringing to you my fifth annual round of Holiday Gift Guides. I always have my qualms about sharing these guides because I hate to contribute to the materialism and commercialism of the season; these are problematic issues year-round, and especially during Christmas, when they can detract from the spiritual and relational aspects of the season. However, I personally find great joy in gift-giving, and also in compiling these gift guides, so the tradition lives on—at least for another year. 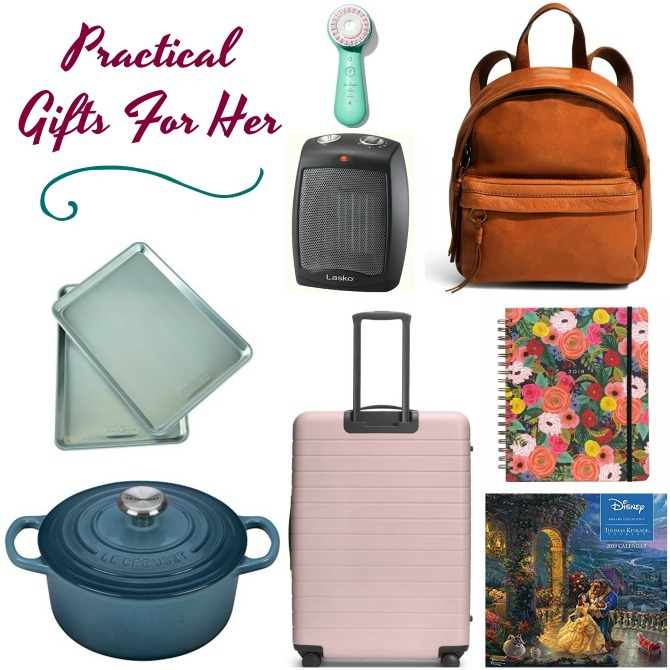 As always, I’ve based these guides off of our family’s personal Wish Lists—because I can’t know for sure what the loved ones in your life will want this Christmas, but I do know what WE would love to find under the tree, and hopefully we aren’t too unlike the man, woman, or preschooler on your shopping list this Christmas. 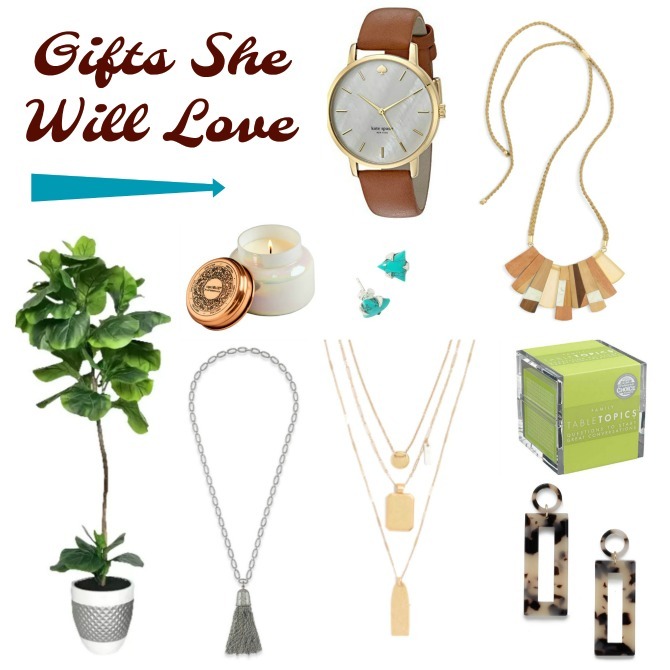 Today I’m sharing my gift suggestions for the woman in your life (or maybe yourself? ), tomorrow I’ll be delivering a special-edition Tuesday post with gift ideas for your man, and on Wednesday I’ll be sharing my Charleston-approved preschooler gift ideas. All just in time for some Black Friday shopping! One more caveat before we get started: unless I’ve noted otherwise the items on these lists are on our personal wish lists, which means we don’t own them yet. Therefore, I can’t personally speak to the quality of the items themselves, though I’ve done some research to ensure that each of these gift ideas will not disappoint! Hmm, I spy quite a bit of jewelry in my “Want” category. To be totally honest, I would happily receive exclusively jewelry gifts for every holiday because jewelry is one of my favorite things and something I rarely buy for myself. I realize that earrings and necklaces aren’t every woman’s cup of tea, so I’ve included a few non-accessory items here as well—all straight off of my personal wish list. Kate Spade Metro Watch ~ Such a classic style. This lovely timepiece is large enough to make a statement, but not too big to overwhelm my small wrist. Noonday Del Ray Necklace ~ Noonday partners with Artisan Businesses from across the globe; because of this model, every purchase helps to create meaningful jobs for people who need them. I adore all of Noonday’s items, especially their unique statement necklaces. I’ve never seen anything quite like this one. Faux Fiddle Leaf Fig ~ It seems every internet home features a Fiddle Leaf Fig these days, and for good reason—they’re lovely! This could be a tough gift to wrap—let alone fit under the Christmas tree—but it would be a much-appreciated gift for a plant lover with a black thumb, like me. Anthropologie Capri Blue Jar Candle ~ These candles smell amazing, and the jars themselves look lovely on my bathroom countertops. I burned through my last Anthropologie candles just in time for this Christmas. Noonday Trinity Studs ~ These studs are another lovely piece from Noonday. They’re a little different from my usual statement earrings, great for everyday wear. Kendra Scott Tassel Charm Necklace ~ Kendra Scott jewelry has become a bit of a cliché, at least here in Austin, but I can’t help but love it. This easy-to-style necklace is currently top of my personal Kendra Scott wishlist, but nearly every piece from Kendra Scott would make a welcome gift. Treasure Pendant Necklace Set ~ I’m a huge fan of necklace layering; I love how this set takes the guesswork out of matching up pieces. Each necklace can be worn individually as well, making this three gifts in one. Table Topics Family Edition ~ Now that Charleston is older, our dinner conversation is much more interesting. These cards could take it to the next level. ABLE Nile Earrings ~ ABLE is a lifestyle brand focused on ending generational poverty through providing economic opportunity for women. Like Noonday, they not only have a business model I want to support, but they also have some amazing pieces. These stunning earrings are from the tortoise collection, which is a trend I’m really digging lately. I also love this pair, and this matching necklace. The older I get, the more I appreciate practical gifts. Each of these items meets a need, but is fun or different enough to be wrapped up and placed under the tree. Clarisonic Mia Cleansing Face Brush ~ I’m skeptical that this item can minimize wrinkles and reduce puffiness as promised, but I’ve heard great things. I’m not getting any younger, so it certainly can’t hurt! Portable Space Heater ~ It’s November which means I am cold ALL THE TIME. This small space heater could do wonders for our heating bill and would actually be a double gift for Luke since I’d no longer be subjecting him to the current sauna that is our home. Update: After showing Luke this guide, he reminded me that we already own a space heater! He pulled it out for me and it’s made my evenings so much more comfortable. If the cold-blooded lady you’re shopping for doesn’t have one, I can tell you from experience that this will make the perfect gift. Nordic Ware Aluminum Baker’s Half Sheets ~ I enjoy baking cookies, but don’t do it as often as I’d like because it takes too long with just two baking sheets in my current kitchen arsenal. I’ve been meaning to add a couple more, and these have great reviews. Le Creuset Dutch Oven ~ Nearly every home cook I know raves about their dutch oven. The teal color of this one is perfection. Away Suitcase ~ Can you believe that, after ten years of marriage, Luke and I still don’t have “real” luggage? This suitcase is attractive, sturdy, and big enough for overpackers like me. Toss in this set of packing cubes which I own and LOVE. Rifle Paper 2019 Planner ~ Full Disclosure: I already purchased this item for myself! After years of switching up my planner every January, I discovered this one last year and don’t think I’ll ever look anywhere else for my planner needs. I use my planner as a form of bullet journal, and this has plenty of space for all that I like to record. The floral cover is beautiful and I appreciate the large size and spiral binding. Thomas Kinkade Disney Calendar ~ I like to have a calendar hanging in our loft, and this one features two of my favorite things: Thomas Kinkade and Disney. Clothing can be difficult to gift, at least for someone like me who is very particular about size and fit. Shoes and accessories make excellent wearable gifts, though, and it’s hard to go wrong with pajamas and sweatshirts. I’ve been very into neutrals lately, hence the lack of color in the collage below; if the gal you’re shopping for prefers brighter clothing, nearly every one of these items comes in multiple colors. Kellen Low Lace Suede Sneakers ~ I’ve been slow to get on board with the sneaker trend, but I’m starting to see the allure. I like that these are a little more upscale than my everyday workout shoes and can be dressed up or down, depending on the day. BP Check Scarf ~ I have a slight scarf addiction, but don’t own anything quite like this on-trend blanket scarf. This is the perfect gift when you don’t know what to give (or for a holiday scarf exchange). UGG Lennon Jersey Pajamas ~ I’ve only recently started wearing “real” pajamas, and this luxurious pair is calling my name. Pretty sure if I owned these, I’d want to make every day a pajama day. Asymmetrical Snap-Up Fleece ~ I’ve been seeing these fleece sweatshirts everywhere, and they are adorable and super cozy. This one comes in six lovely colors. UGG Ansley Slippers ~ I don’t own any UGG slippers, but I’ve tried them on in the store and they are amazing. These come in eight colors, and I’m surprised by how much I love the pink. UGG Pompom Cable Shearling Beanie ~ Beanies are another weakness of mine. The cable knit of this one is so chic, and who doesn’t love a good pompom? Barefoot Dreams Cozychic Coastal Hooded Cardigan ~ A friend of mine owns this and I ask to wear it every time I’m visiting her house. (That’s not weird, right?) It is just about the softest item of clothing I’ve ever touched, and these days it’s totally acceptable to wear a cardigan-resembling-a-robe in public! Felt Panama Hat ~ Hats aren’t for everyone, but I’m a hat girl through and through and would love to add this to my collection. ABLE Rojas Mules ~ I don’t own any mules and didn’t think I was a fan of this trend until I saw this lovely pair from a great company. They come in several other, more adventurous, colors but I’m drawn to the classic cognac. I do most of my reading digitally these days, and when I do read a physical book, it’s usually from the library because if I kept copies of every book I read, my house would resemble a Barns and Noble. That said, all of the items on this list totally deserve to occupying precious bookshelf space. Q & A a Day for Moms: A 5-Year Journal ~ Not technically a book, but a gift I’m sure any mom would appreciate. I’ll probably buy this for myself if I it’s not beneath my tree this year, because Charleston is at the perfect age to begin documenting these things. How to Talk so Little Kids Will Listen: A Survival Guide to Life with Children Ages 2-7 ~ I’ve read through nearly every parenting book my library owns, but they don’t have this one! I liked the big-kid version, but feel this little kid version would be more helpful for our current stage. Bibliophile: An Illustrated Miscellany ~ This is billed as “the perfect gift for book lovers and writers.” That’s me! Anne Bogel suggested this as a great companion to her book I’d Rather Be Reading, which I adored. Harry Potter and the Prisoner of Azkaban, Illustrated Edition ~ These illustrated books contain the full text of the original Harry Potter novels, accompanied by gorgeous illustrations. I own and cherish the first two books in the series and hope to eventually acquire a complete set. Salt Fat Acid Heat: Mastering the Elements of Good Cooking ~ I’m intrigued by this book that doesn’t just offer recipes, but teaches you the basics of mastering a dish. Parenting Scripts: When What You’re Saying Isn’t Working, Say Something New ~ The authors of this book were on Focus on the Family recently, and their advice was so solid and applicable that I instantly added this one to my TBR. Skinnytaste One and Done: 140 No-Fuss Dinners for Your Instant Pot, Slow Cooker, Air Fryer, Sheet Pan, Skillet, Dutch Oven, and More ~ Skinnytaste is one of my go-to recipe blogs. I own and regularly cook from Gina’s first two cookbooks, and this third looks to be her best yet. To Bless the Space Between Us: A Book of Blessings ~ I’ve been wanting to add a collection of spiritual poetry to my book collection, and a number of sources have pointed me to this book. Personality Hacker: Harness the Power of Your Personality Type to Transform Your Work, Relationships, and Life ~ Personality Hacker is one of of my favorite podcasts and I was thrilled to see that the cohosts had released their first book. This book promises to give all the nitty gritty details of the Myers-Briggs system, which is perfect for a personality nerd like me. Not Pictured: Leather She Reads Truth Bible ~ I’ve owned the same Bible since high school, and while I love it and will never get rid of it, I’ve been wanting to try something new. The She Reads Truth devotionals have been such a good resource for me, and I’ve heard wonderful things about this Bible. I personally like the leather cover, but there are a few other options as well. That’s a wrap for Part One of my 2018 Holiday Gift Guides. 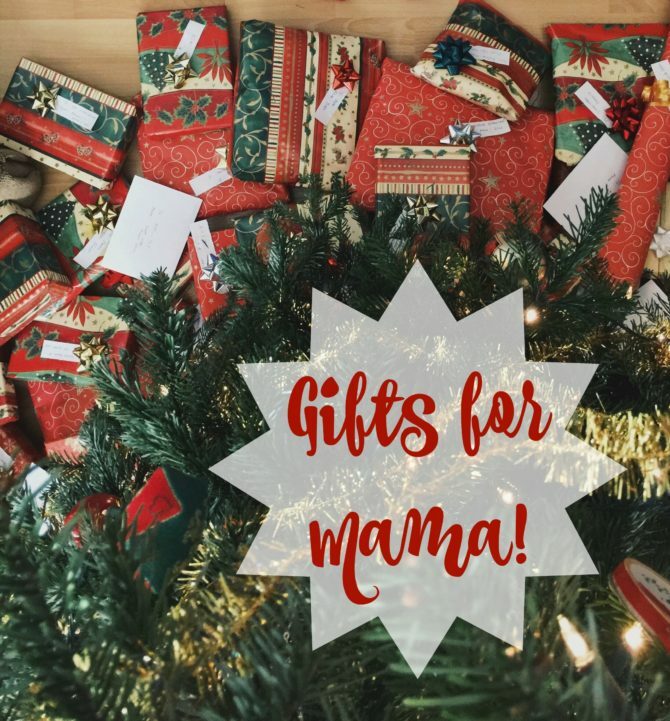 If you’re looking for some more ideas for the ladies on your shopping list, check out last year’s Gifts for Mama Guide inspired by my 2017 Christmas Wish List. 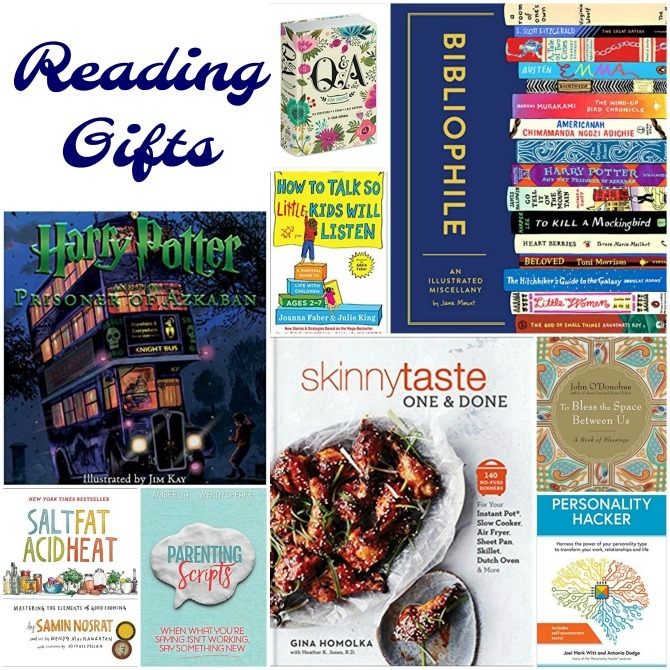 That post will also direct you to some past gift guides you may want to check out. I’ll see you right here tomorrow with some great gift inspiration for the gentlemen!